I have had the opportunity to cook hundreds of breakfasts for groups from 30 to 1,500 or more people. This is a collection of my notes and ideas that I have used to organize, plan, purchase cook and serve these types of breakfasts. First, consider where you are cooking and the environment you have to deal with. For example, If you're out int he woods then it may be really cold early in the morning and require more time to heat up griddles, water, etc. Also it may be windy which can cause difficulties in keeping flames lit or it can rapidly cool down food that is supposed to be hot. You also need to consider how it is to be served. Are people straggling into eat over a two hour period or are they all eating at one time? Are they all adults or is it adults and children? Is it hungry teenage boys or is it a group of petitie older ladies? What kitchen resources do you have available? How much griddle space do you have? Do you have a stove or oven? Do you have tray holders and warmers? Is it casual or kind of formal? All of this should be identified to get proper quantities and so you are prepared. I usually do two kinds of scrambled eggs. One is just plain and the other has more "stuff" in it. The stuff vaies from just shredded cheese to fully loaded with diced green chiles, onions, peppers, etc. It really depends on the group I'm serving. Proportions of the two also depends on the group and my gut feel. Generally for women and children I do more of the regular. For groups of men I do more of the fully loaded. Eggs can be purchased in three major ways which are: Individual Eggs, Carton Eggs or Bagged Eggs. My hands down choice is the bagged eggs if you can get them. These come scrambled and frozen with about 5 dozen eggs in a bag and 6 bags to a case. To cook them, place the bags into a pot of boiling water for about an hour. Pull them out and massage them to get the uncooked egg distributed about every 10 minutes. This cooking can be done early on and even somewhere else. For example, if I am cooking a breakfast at our neighborhood church I would have other people boil the egg pouches at home and bring them hot, wrapped in a towel. Or if I were cooking a bunch I could put the hot cooked bags into an ice chest to keep them hot. Once I'm ready to serve I can cut the top of a bag and dump the eggs into a disposable half tin. I then add a handful of cheese, salt and pepper, fluff the eggs with a serving spoon, and serve. I have received the best compliments ever on these eggs as they are moist and perfect. Carton Eggs usually contain about 18 scrambled eggs per carton and a case is 12 cartons. These need to be cooked in a fry pan or on the griddle. I'm not as fond of these as they tend to interfere with other cooking. They can't really be cooked ahead of time so it makes for a lot of cooking right before things are served. One option is to bake them in disposable half tins. If they are baked you need to make sure the tin is sprayed with cooking spray and covered with foil. You will need to pull them out and stir them a few times during cooking. My last choice is whole eggs. They take time to crack, need to be mixed and then cooked. This takes way too much time but sometimes that's all you have available. For sizing I generally figure two eggs per person. This can vary depending upon the group as discussed previously. Most people ask for bacon. I don't do bacon because it's a real pain. Cooking bacon requires a lot of time and puts out a lot of grease. It must be cooked on a griddle or it can be cooked in the oven on baking sheets with parchment paper. Both are a time consuming mess. You cna also get pre-cooked bacon which can be heated in the oven. This also is a pain because it takes a lot of sheets to get enough bacon and the bacon is generally less flavorful and usually very thin. So I don't do bacon. I prefer pre-cooked sausage. It's quick, easy and tastes good. There are some brands that lack flavor and you'll need to figure that out as you go but most are of good quality and great taste. You can get sausage in smaller portions but in general for food service they come on a ten pound box. I prefer the 0.75 oz links but you can get them in a variety of sizes and shapes. Patties tend to be a little more difficult to cook. Pre-cooked sausage can be warmed up on a cookie sheet with parchment paper in the oven, or it can be warmed up on the griddle. I prefer the griddle method. I heat up my griddle up hot then dump an entire box of sausage on it. I then dump about half a pitcher of water on them and use the spatula to spread them out. I then roll them around a little and they're done. The steam from the water gets them thawed out quickly and the griddle adds cooking marks and sometimes crispiness that I like. I figure about two sausages per person (ie a box would serve about 100 people) but again this could vary depending upon your group. These come in every shape and size and are usually fairly inexpensive. I usually pick one of three varieties: shoestring, cubed or patties. My personal favorite is the patties or "101's" as tehy are called in the food service industry. These can be cooked in the oven or fried. If you have several commecial convection ovens availabel then these are a good choice. I also routinely do the cubed. These are mostly done on the griddle although they can also be done in the oven on a cookie sheet. The shoesting or has browns are my least favorite. They need to be cooked ont eh griddle and take much more time and effort. Potatoes are optional. for most breakfasts I don't include them but sometimes people ask for them and so those are your basic options. Commercial potatoes generall come packaged in 5lb bags with six bags to a 30lb box. Each bag generally fits on one full size cookie sheet. I figure about 35 people per bag. There is only one choice in my book for pancakes and that is Krusteaz Complete Buttermilk pancake mix. Make sure it's that brand and that variety specifically and you're good. All you need to do is add water, mix and it's good to go. You can find it in small boxes at the grocery store or in five pound bags, 25 lb bags or 50 lb bags at food service distributors. A five pound bag generally serves about 50 people. Have one person mixing the batter, another using a cup to scoop the batter into a pitcher and then pouring the pitcher as needed onto the griddles. Spray cooking spray on the griddle between each batch. 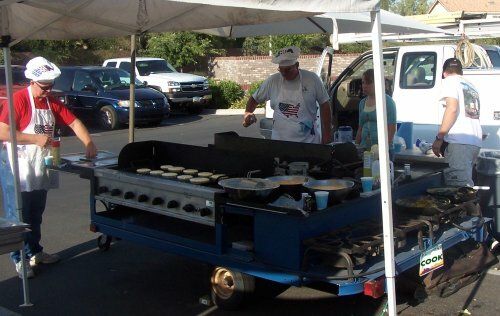 Then have one person on each griddle to flip the cakes. You will need one other to run cakes into the serving area as they are done. Mix the pancake batter thinner than you would normally do at home. Yes it looks runny but that is what works best. Once the cakes are poured they will bubble as they cook. When the bubbles pop and don't fill back in with batter then they are ready to turn. Pancakes are the last thing to cook. I start cooking them about 15 minutes before serving. At that point everything else should be done and being prepped for the serving line. The pancakes should come off hot and be served immediately. By keeping the batter thin and the griddles hot, you should be able to keep up with the line and serve cakes hot off the griddle. This is why having a runner is important. I generally serve a juice type drink. I love orange juice but it can be pricey at times. I often substitute others such as a punch (powdered drink mix, Tampica, Sunny Delight or Tang). I usually also have a gallon or two of milk available. Although you can just get canned fruit (fruit cacktail, peaches, etc.) there is nothing like fresh fruit. Try to delegate this out if you can. In season fruit such as watermelon, canteloup, strawberries, etc. can be easily diced into a fresh fruit salad. Butter: Butter is often very hard on a cold morning and difficult to scoop and spread. You can make this a little easier by purchasing whipped or softening it beforehand. I've used squeeze butter but it's expensive, they use more and the bottles end up a mess. I usually buy a large tub of margarine and scoop it into disposable bowls for serving. Syrup: This is best purchased in a gallon plastic jug. Then put it into squeeze bottles for serving. A disposable water bottle with a knife slit in the lid works great and you can throw them away when you're done. Serving: Consider having people serve. Portions are much better controlled this way. If people are serving themselves then control the serving size by your utensils. That big serving spoon might be easy to grab and put into the eggs but the first ten kids that go through will take huge scoops of eggs and end up throwing them away. Put smaller spoons and use small salad tongs to help limit how much people take. Serving Line: Put the butter and syrup in a separate area. If you put it at the end of the line then the serving line will get backed up waiting for people to dress their pancakes. I live in Mesa, Arizona. These are resources that I know are available here. Other areas may or may not have these available. Restaurant Depot This store is not open to the public. It is like a Sams Club or CostCo but they only carry food service items. Here I can get Sausage, Cartonned Eggs, Potatoes, Pancake Mix, Syrup and Fruit. Smart and Final They have most of the items but not by the case. For example, Sausages and Potatoes are in smaller bags. CostCo, Sam's Club These places have most items but again, they are in smaller almost consumer size packaging as compared to commercial sizes. Shamrock Foods, US Foods, etc.These places have everything but you must have an account with them and items must be purchased by the case. Great for huge breakfasts but not very usefull for small to mid size one's. These are the only places that I have been able to buy bagged eggs. You may also find smaller companies who buy from these and distribute. For example, in the Phoenix area, Lively Distributing will purchase a case of bagged eggs from Shamrock Foods and sell them directly to you. American Discount Foods is located on Extension in Mesa. They are a scratch and dent commercial food distributor. You need to be careful what you buy there but they have some great deals. What they have vaires from day to day. I go back to the freezer area and just tell them what I need. They generally have a variety of potato products, frozen juices, eggs and sausage. If they have bagged eggs (50% chance) then they may have some bags with pinholes in them (tough to boil but can be done) and some without. Good deals but hit or miss on items. Don't plan on using them as your primary food source but once in a while they have most everything and the price is good. Note: The supervisor is key. They make sure everything is done on time and is ready to serve hot. They keep the clock for all items. They also keep tabs on the cooks as well as the serving line. Please make sure all tables are removed and the griddles are turned off (knobs all flat horizontally) before lighting! One of the regulators is not working but the propane tanks are cross connected. So turning on one regulator will run both sides (if needed). The regulators are high pressure regulators. They only need to be turned on a small amount. Turning them up too high will not allow you to control the griddle temperature with the front knobs. Bring 2-3 small bottles of water. Drink Water. Cut small opening in caps and fill bottles with syrup. Place out for breakfast. Throw away when done. Heat griddle. Pour sausage on griddle. Pour pitcher of water over sausage. Move sausage around for 3 mintes and then place in steam table tin with lid. Pour eggs carefully and slowly on griddle. Form a line near the bottom as a "dam" to keep the rest of the egg from running down the drain. Salt and pepper as it cooks. Open green chilis and add to half the eggs. When done scoop into two steam table tins. Add cheese as needed. Cover. Mix pancakes thinner than you ever would at home. Use the cup to scoop it into a pitcher. Start cooking 5 minutes before serving. Spray PAM onto the griddle in between each round of cakes. Pour small cakes onto griddle. When the batter bubbles but the holes don't fill back in with batter then it's ready to flip. Place into steam table pans, cover. Clean the griddle while hot by pouring small amounts of water on them and drag them with a paper towel folded under a spatula and dragging that over the griddle. Be sure to also clean out the grease traps. Make sure all propane tanks are turned off. The one special counter leg with the tabs goes in the holder first! If properly positioned, the tabs will firmly lock the drawers shut. The other three poles will lock it into place. Please refill the propane on the cook trailer after use before bringing it back.